Home Page: ordering instructions, e-mail, policies, etc. ¶ condition: used but OK.
OCS-4 I. Manor note: not a Crest and Seal chip due to small greek key mold; has a litho inlay. I used to have about 15 dupes of this; this is the last dupe. Wash. note: I was told by the person who sold the chips to me (he lived in the state) that JV is for Jake Vohs, who ran the tavern in the 1920'-30's. He says Jake was arrested the day after Prohibition started. He opened the bar after he got out of jail, so I am told. condition, colors, prices: have one red chip, fine condition, except for very tink edge burn on one side. $70. OCS-6 MK (it looks like) colors: dark brown ("$5" denomination), green ("$25") and yellow ("$50"). note: this chip is very similar to the U.S. Playing card Co. chip on page 46 of the Herz USPC guide. Same "MK" script. I am told that the ones offered here were made by the old Burt Co. The USPC order card says they (the USPC ones) were shipped to Chicago IL in 1927.
translation) colors: yellow (10), and blue (5). identification: I just learned that the chip is from the Cathay Social Society, 1939-1941, located at 801 Webster Street, Oakland California. The Chinese characters stand for "Many Members," which is similar to Peoples' Casino. pictures: click here to see both chips. note: these chips have litho inlays, but are not exactly Crest and Seals because the chips are "machined" (many fine, close circles like a phonograph record; can't see the effect in the scan), not flat. Neat chips. ¶ condition: most have a small burn on one side, some on both sides. -- blue is excellent though! ....... As the pictures show, each side is different. ¶ attributed to: D & D Bar, Anchorage, Alaska -- Al. Fox, owner. OCS-17 Calif. Games Equipment Co. note: I also have one used yellow one with a "$1.00" inlay -- $10.00 for that chip. CA ¶ available: 4 chips, all pictured here, though the colors don't reproduce so well: white 50, black w/ no denomination[black one sold], yellow 500, medium blue (faded on one side) 100. Roulette Table A ¶ for sale -- red-wine, white, blue, yellow, light green and gray, pink. ¶ condition -- very fine-fine. Roulette Table B ¶ for sale -- red-wine, white, light blue, green, yellow, pink and gray. Roulette Table C ¶ for sale -- white, light blue, yellow, pink, light green, and gray. Roulette Table D ¶ for sale -- red-wine, white, yellow, pink, blue, light green and gray. 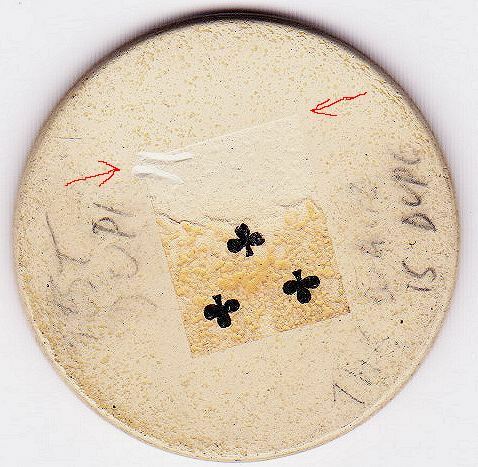 ¶ condition: two problems -- (a) cigarette burns on the chips -- slight on the reds and browns, more significant on the yellows; and (b) originally the chips had the name "Jack Shivel" above "Alcazar," and the name "Willie Green" below "Alcazar." As you can see, the name "Jack Shivel" was scraped off (dissolved partnership?) except on one chip that survived intact. ¶ it is a mystery as to what and where the club was. There is a club by that name (1952 opened; closed now) listed in San Diego CA in The Gaming Table. ¶ per Richard Hanover, 8/08: I've learned that the ALCAZAR was located in downtown San Diego. The card room was run by Jack Shivel and Cecil "Willie" Green. The source of the attribution is Jack's son John Shivel, Col. USAF (Ret.). According to John's sister, she thinks that her dad's named was scratched off the chips after he divorced their mother in 1945-46. (I'm trying to get more details). I was also told several interesting details about the life of their father, an interesting person to say the least. Without permission, I'll withhold the details. Suffice it to say, you didn't mess with Jack. ¶ very unusual (and rare) crest and seal. Unusual in that it is a relatively small chip (1-1/4") and in that it has a non-round inlay (shamrock-shaped). Has the usual crest and seal litho inlay. ¶ great find; not in the USPC records, but those records are not complete; this is a typical, high-quality, USPC-like crest and seal. ¶ the Chinese character in the center is "5." The other characters translate to Singapore Club in City of Chicago. ¶ made 1900-1910, in the first group of crest and seal chips ever made; see here. Attributed to Lafayette College, Easton, Pennsylvania (or maybe Lehigh University, Bethlehem, PA); see here. ¶ only 26 of these chips were found in March 2006 -- 4 reds, 6 blues and 16 whites. Most are in the singles collection of collectors. ¶ these chips are unlike the typical USPC crest and selas. On all of them the inlays became stained in places and were found lifting some on the edges. One thing very unusual is that the whites and blues have 25 mm inlays, and the reds have 22 mm inlays -- only set I know of where the inlays are different sizes! Click here to see the three colors and sizes. ¶ 1929-39 Gambino and Anastasia crimes families controlled the club, per "The Gambling Table." New Southport Club, New Orleans, La. ¶ blue (inlay marred on one side). ¶ located at 1300 Monticello Ave, Jefferson Parish, Metairie, La. (borders western New Orleans). Owner: Carlos Marcello. Opened 1932, closed 1962, per The Gaming Table. Formerly Jefferson Inn. ¶ clay very nice on the chips. Inlay on one side is very nice. BIG PROBLEM: parts of the inlay on the revese side have been scratched away! ¶ 1960 roulette chip from this casino. ¶ have just one chip in yellow: fine chip except one side has many very fine scratches that you must strain to see. ¶ typical USPC-looking chip, and likely made by USPC but not in their library volumes. I suspect it is a generic chip. ¶ yellow (Table B), maroon (Table E) -- nice used condition. ¶ this is not exactly a true crest and seal: the basic chip is nylon composition, and yiu can feel with your finger nail where the inlay and the base color of the chip meet. ¶ probably made by USPC Co., but not found in their records, which are incomplete. ¶ note the "H" in the lower burgee (light identification pennant flown from the top of a boat's mast). The "H" burgee was EF Hutton's personal burgee from his yacht the "Husser". The other burgee was for the New York Yacht Club. ... .. .... More about this chip in the box directly below. ¶ one chip, my choice, decent condition. ¶ these chips were made in three colors of clay chips (red, white and blue) for all 52 playing cards in a deck. Click here to see a complete set on white clay chips (my personal collection). These chips were made with the card image on one side; the other side being plain. ¶the chips are relatively rare. Besides my white clay set (see above), I have only about 7 chips left. I am the only person selling these, that I know of. One is pictured on page 360 of "Antique Gambling Chips." ¶ although some collectors refer to these as paste-ons, to me they are thin-inlay chips! Click here to see one chip where I pried away the inlay with a knife, and you can see (between the two arrows) where the chip is recessed for the inlay! More about OCS-42: The chips were probably kept on his yacht. They were found on the E.F Hutton estate (Mar-a-Lago) in Palm Beach, Fl. I could furnish you with photocopies of (1) a page from "Lloyd’s Register of American Yachts" “Private Signals of Yachtsmen” which shows 64 pennants and the names of the owners — the one for Hutton has his full name and a picture of the pennant, just like on the chip, and (2) an unsigned statement from the owner of the chips, who was connected to the Hutton estate, giving the provenance of the chips, etc...... ... ..... Edward Francis Hutton (September 7, 1875, New York City - July 11, 1962, Westbury, Long Island, New York) was an American financier and co-founder of E. F. Hutton & Co. It became one of the most respected financial firms in the United States and for several decades was the second largest brokerage firm in the United States. He was the head of many other U.S. corporations. He built many large mansions including Mar-A-Lago (now owned by Donald Trump and operated as the Mar-a-Lago Club) in Palm Beach, Florida. He is still well-known from the advertising slogan "When E. F. Hutton talks, people listen." His daughter was the actress Dina Merrill.